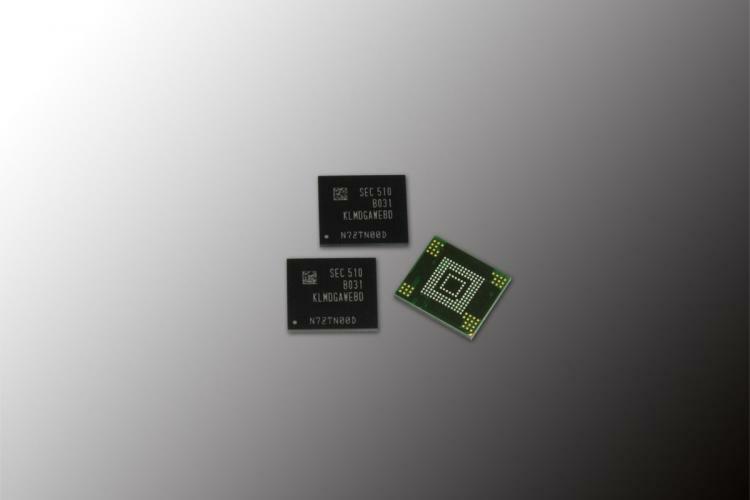 SEOUL, Korea – March 19, 2015 – Samsung Electronics Co., Ltd., the world leader in advanced memory technology, today introduced a high-performance mobile memory storage based on Embedded MultiMediaCard (eMMC) 5.0 technology. The new 128 gigabyte (GB), 3-bit NAND-based eMMC 5.0 storage is targeted at the smartphone and tablet mass markets. The new 128GB eMMC 5.0 delivers 260 megabytes per second (MB/s) for sequential data reading, which is the same level of performance as that of MLC NAND-based eMMC 5.1 memory. For random data read and write operations, it can handle up to 6,000 IOPS (input/output operations per second) and 5,000 IOPS respectively, which is sufficient for supporting high definition video processing and advanced multi-tasking features. These IOPS speeds are approximately four and 10 times faster, respectively, than those of a typical external memory card.